for the 2009 Open Show, despite the rainy weather that Saturday! DiQuinzio, Assistant Curator, San Francisco Museum of Modern Art. Distinct by design, LAAA's annual Open Show has developed into one of the most potent survey exhibitions on the West Coast. 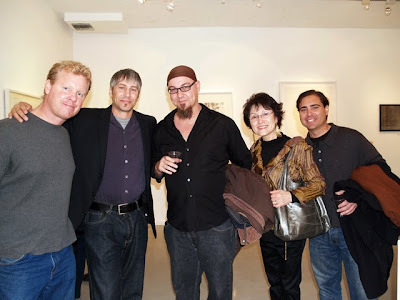 The opening reception was from 6-9pm on December 12, 2009 and runs through January 8, 2010 at LAAA's Gallery 825. Lillian Abel, Ruben Acosta, Robin Adsit, Fegie Barkan, Lisa Bartleson, Catherine Bennaton, Jeff Berman, Steve Burtch, David Chappell, Ching Ching Cheng, Lisa Deutsch, Babak Emanuel, James Erwin, Melanie Florio, Steven Fujimoto, Alisa Gabrielle, Gina Galileo, Libby Gerber, Helen Geisler, Michael Giancristiano, Tm Gratkowski, Jenny Hager, Lydia Moon Hee Kim, Danny Heller, Liza Hennessey Botkin, Anne Hieronymus, Velda Ishizaki, Flora Kao, Kyung Ja Kim, Eva Kolosvary Stupler, Alan Kupchick, R. Dean Larson, R. Matt, Katherine McNamara, Barbara Nathanson, Janice Nowinski, Saule Piktys, Bryan Schnelle, Cory Sewelson, Sharron Shayne, Susan Sironi, Patrick Slattery, Tree Stokes, Jamie Sweetman, Lacey Terrell, Luke Van Hook, Michael Verbenec, Bendow, Karl West and Marco Zamora. The Open Show runs through January 8, 2010.